Hi! Hi! 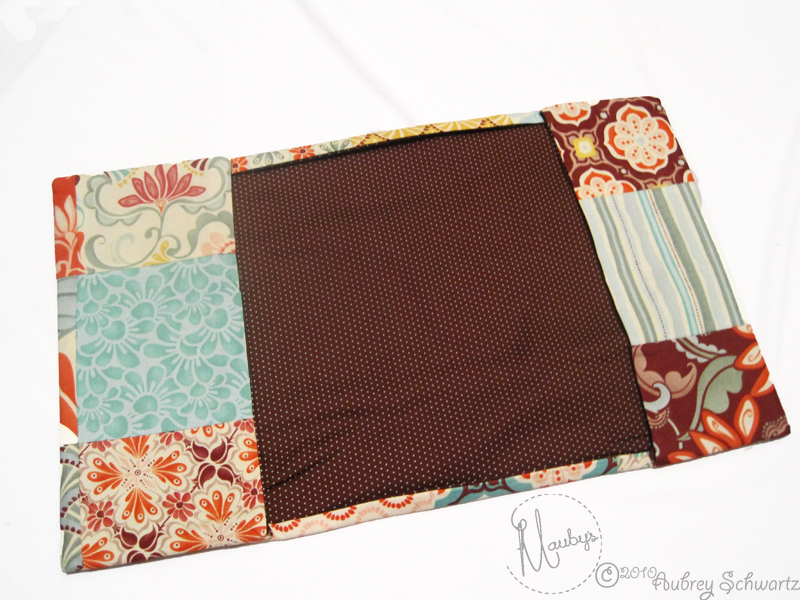 This is Aubrey from Maubys here with my very first post for the Moda Bake Shop! I am so excited to be cooking with all of you today and hope you enjoy this recipe. 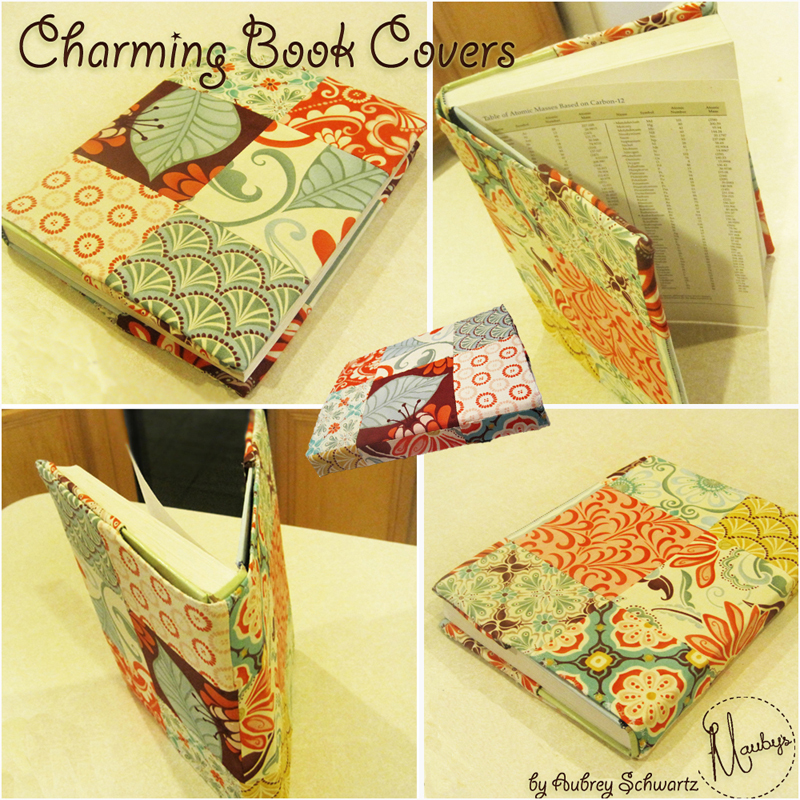 Here is a little something to spice up those brown paper book covers. Making them a little less…well brown. 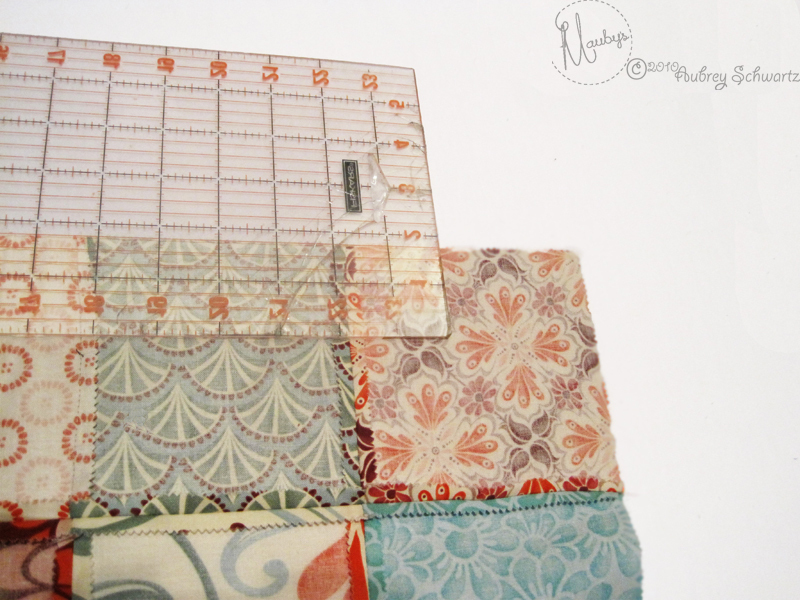 Backing fabric to coordinate with charm pack (needs to measure at least 10″ wider than the book width and 2-1/2″ longer than the book length), muslin is also a good option. 1. 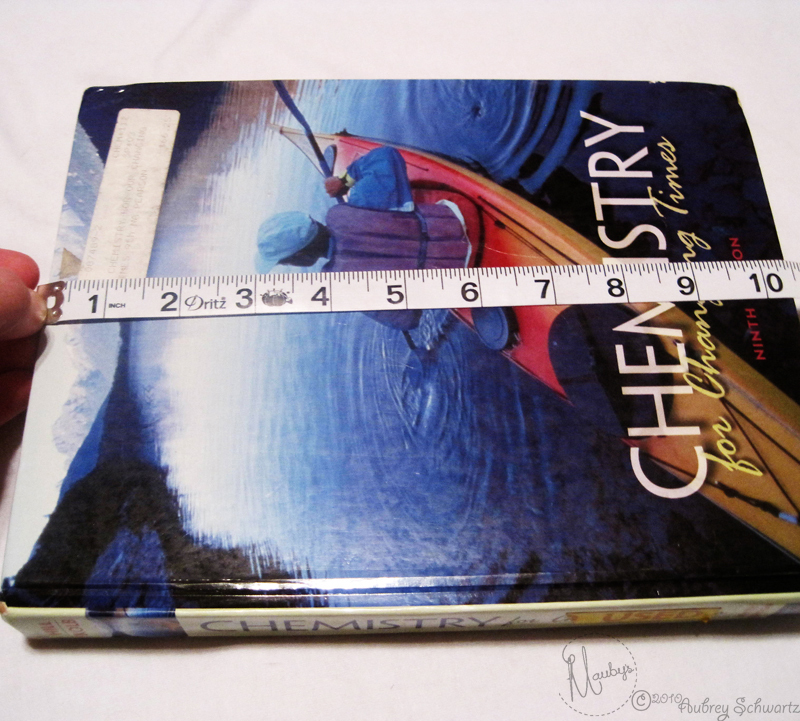 Measure the complete width of the book to be covered by starting at the the back left side and wrapping the tape measure around the book. 2. 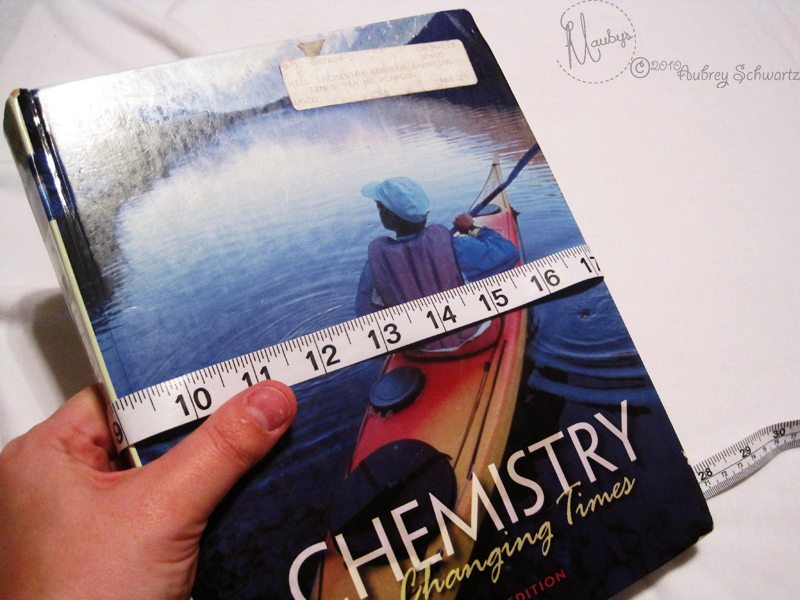 Measure the length of the book. 3. 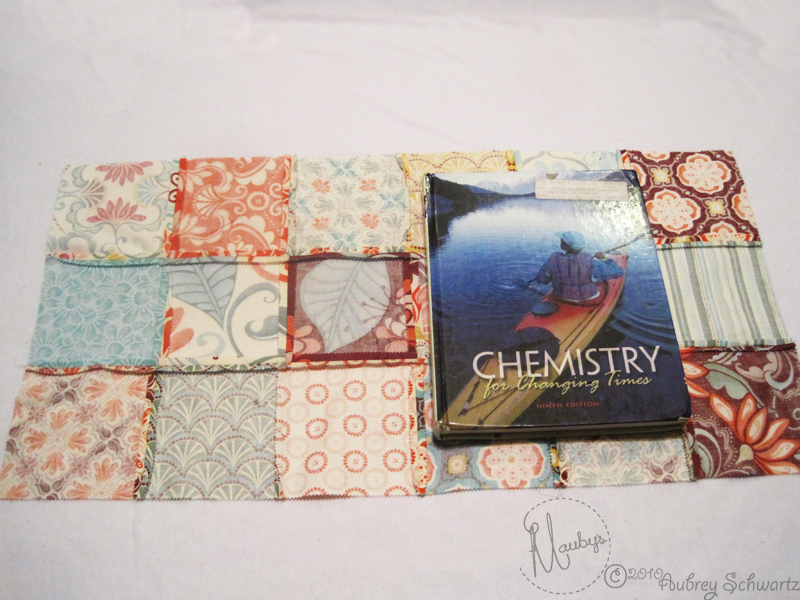 Determine the number of charm squares you will need based on your measurements and then add 2 more charm squares to the width of the book and 1 more charm square to the length. 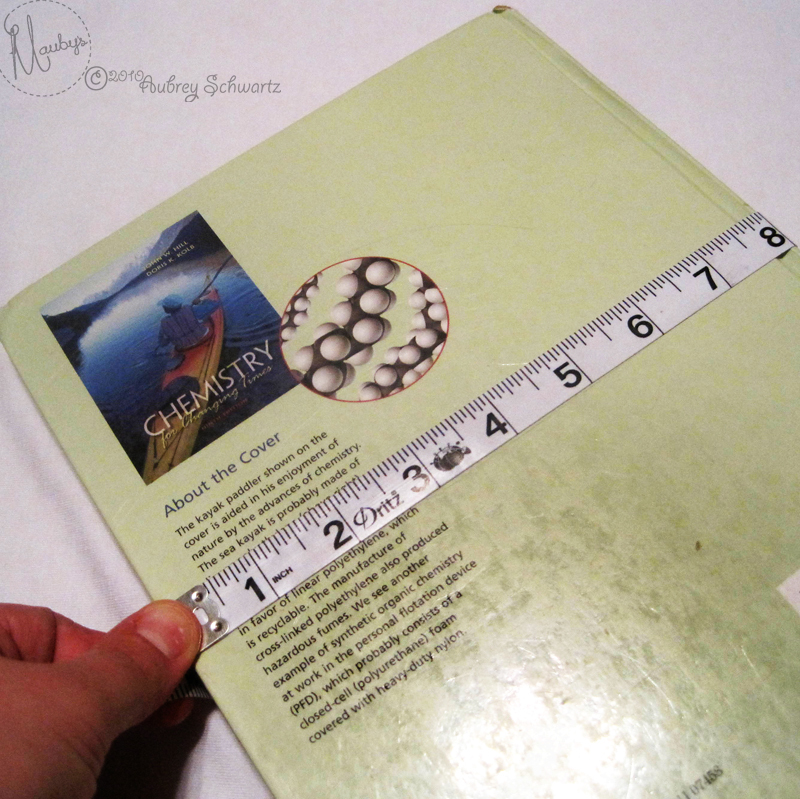 The book in the picture measured 17-1/2″ in width and 9-1/2″ in length. 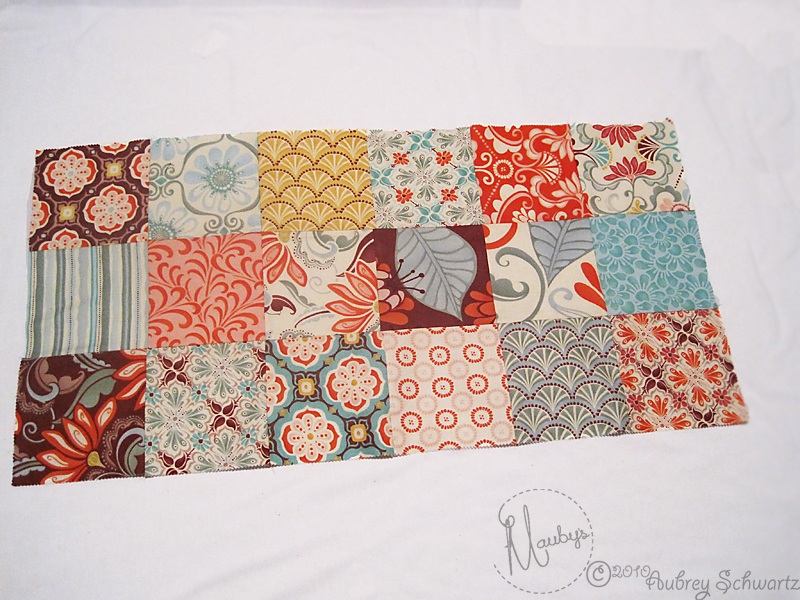 So I needed 4 squares to equal the initial width plus 2 squares for the end total. 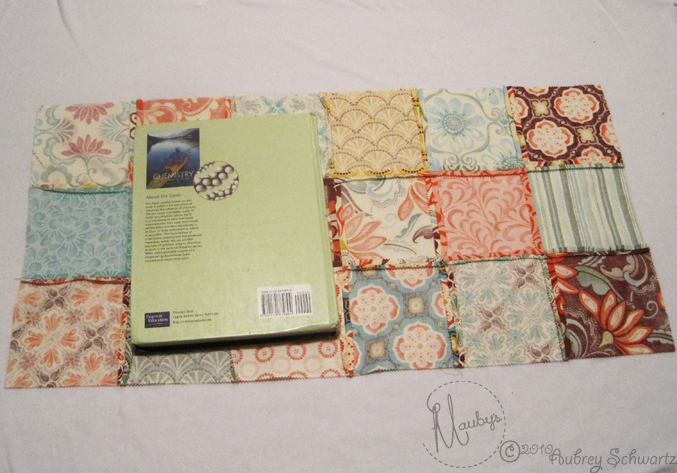 And then I needed 2 squares to equal the length of the book plus 1 square for the end total. 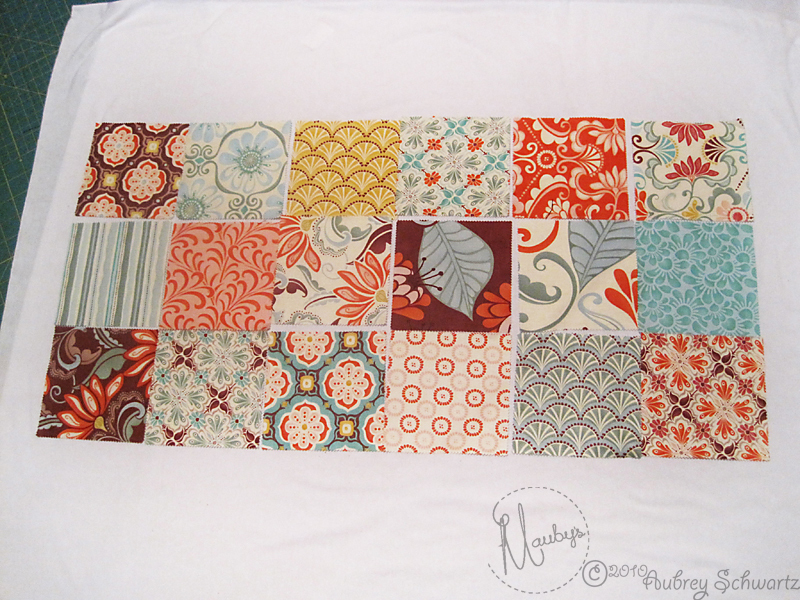 My final amount was 6 charm squares across by 3 charm squares down for a total of 18 squares. 4. 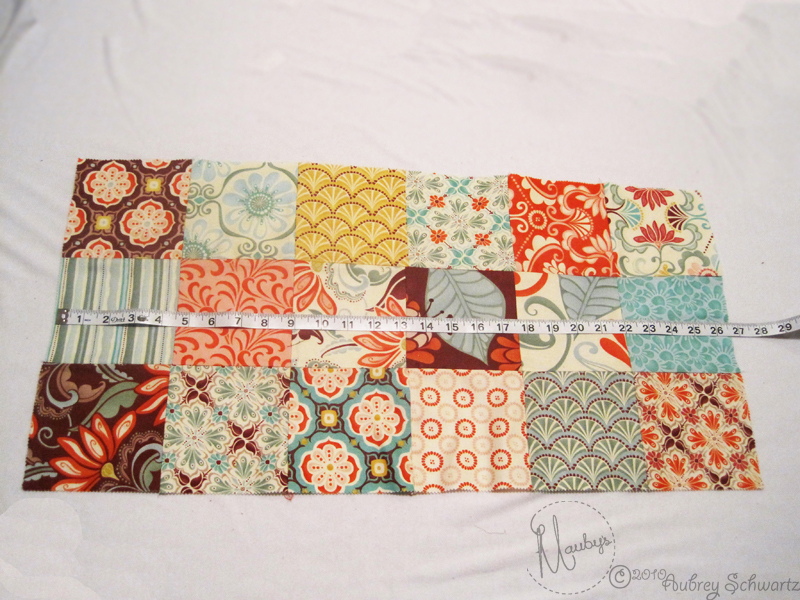 Sew all your squares together with 1/4″ seam allowance. 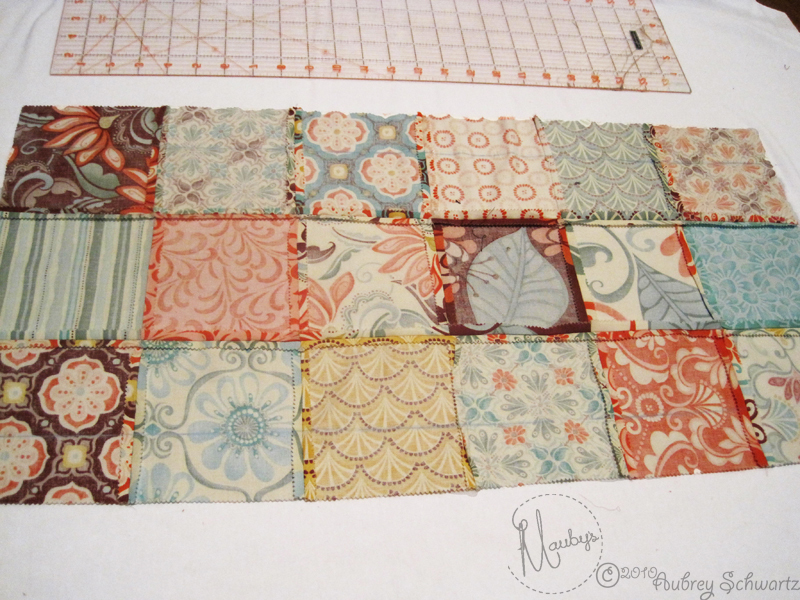 The easiest way to do this is to sew the greater number of squares together into rows and then sew the rows together, lining up the seams to create a patchwork cover. 5. 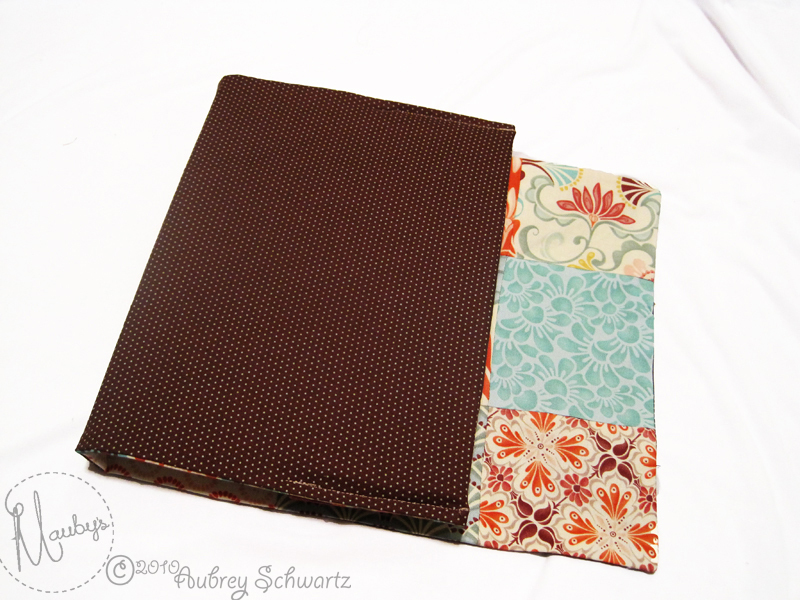 The sewn together squares should be as close as possible to 10″ wider than the book measurement. 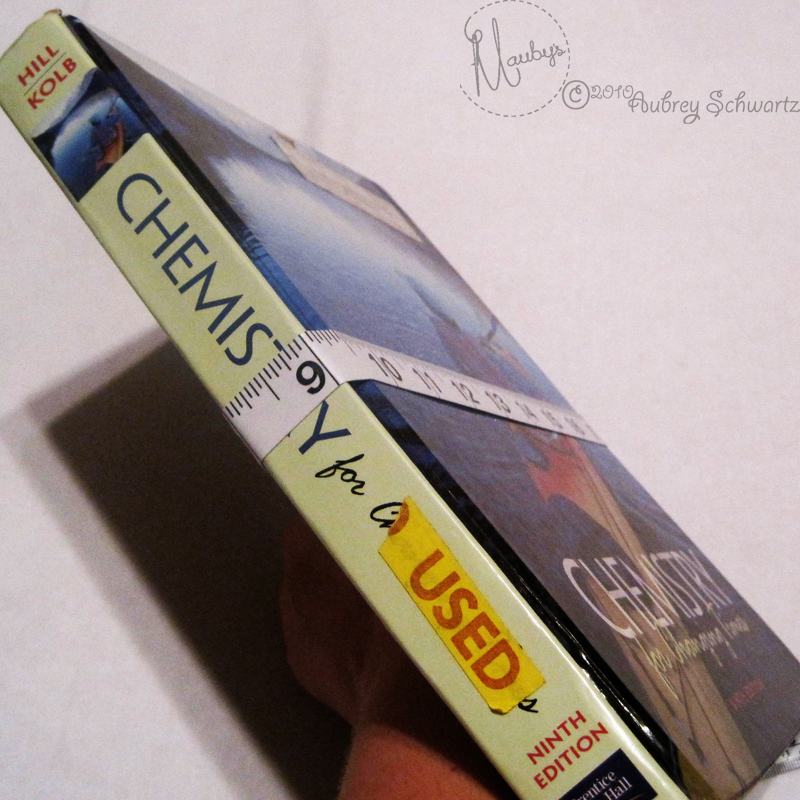 And the length should be as close as possible to 5″ longer than the book measurement. 6. Measure 1-3/4″ in along the widthwise edge of each side and draw a line. 7. Fold the widthwise edge in to meet the line just drawn and press. 8. 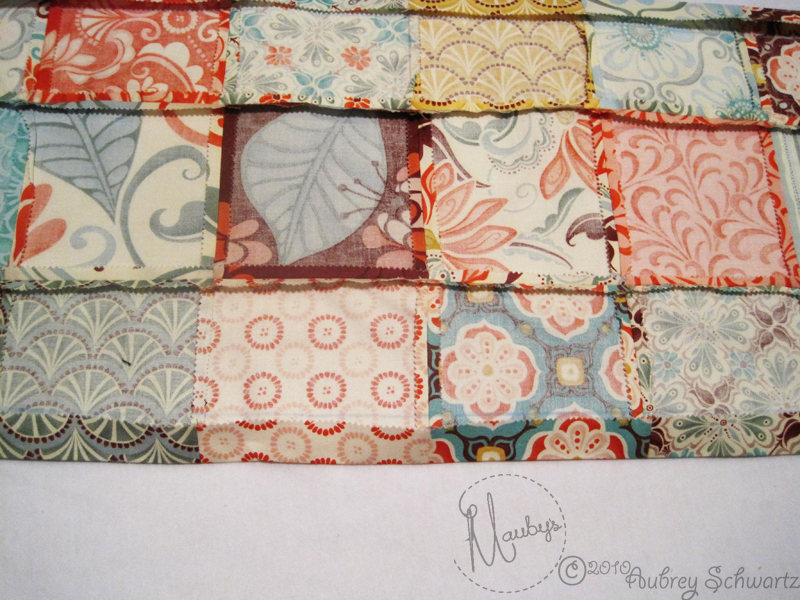 Lay the patchwork top on the backing fabric, right sides together. 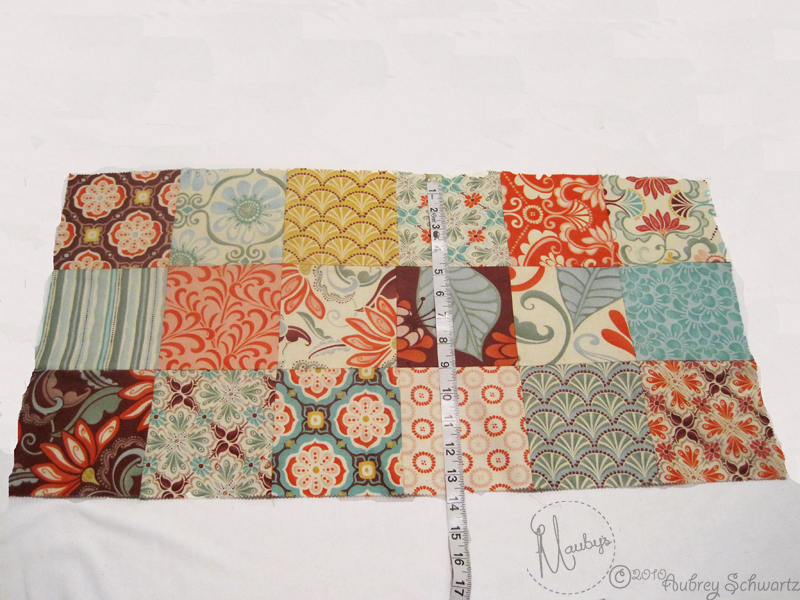 If you have not cut the backing fabric to fit the measurements yet, then cut it to match the patchwork top. 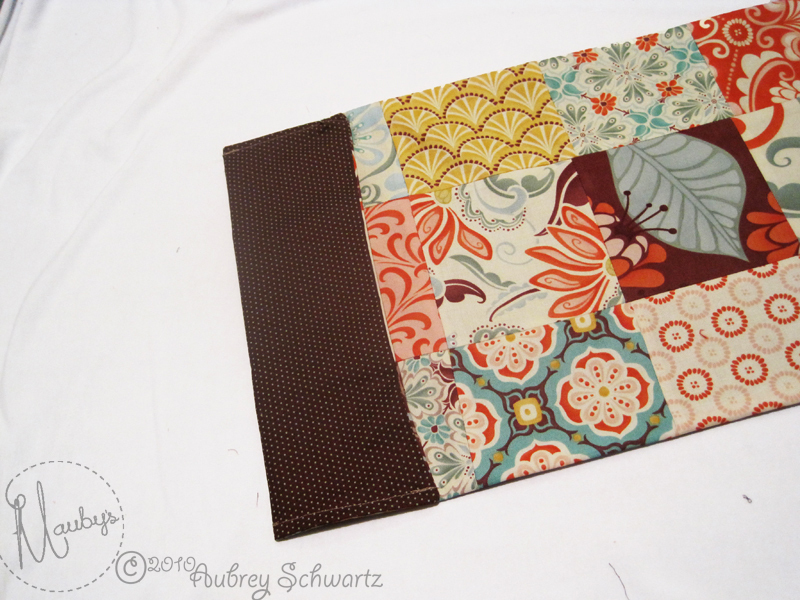 Pin and sew the just folded patchwork top along both widthwise edges to the backing fabric with a 1/4″ seam allowance. 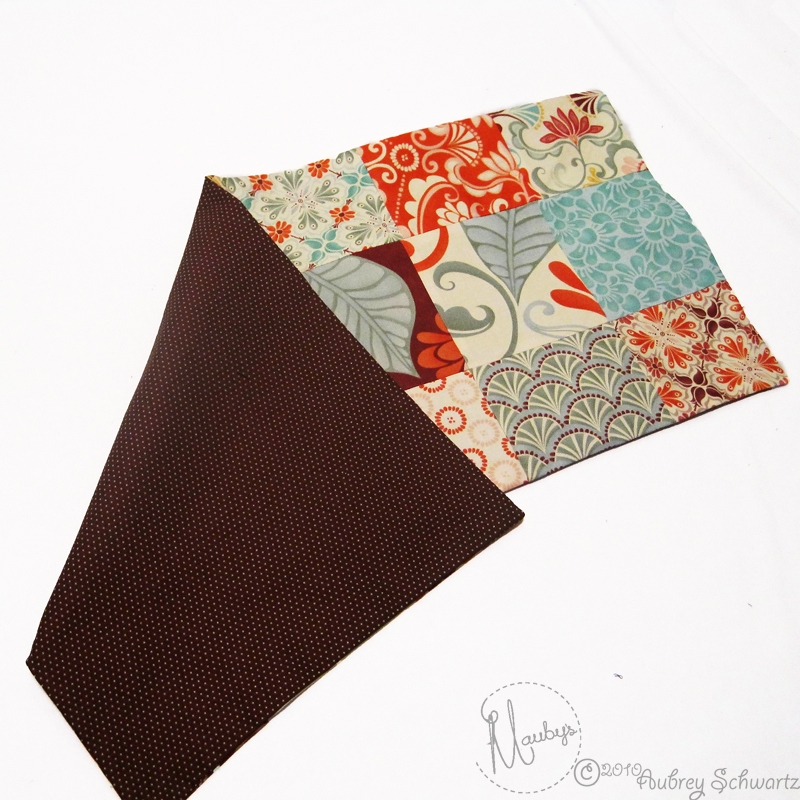 Sew one lengthwise edge from top to bottom with a 5/8″ seam allowance. 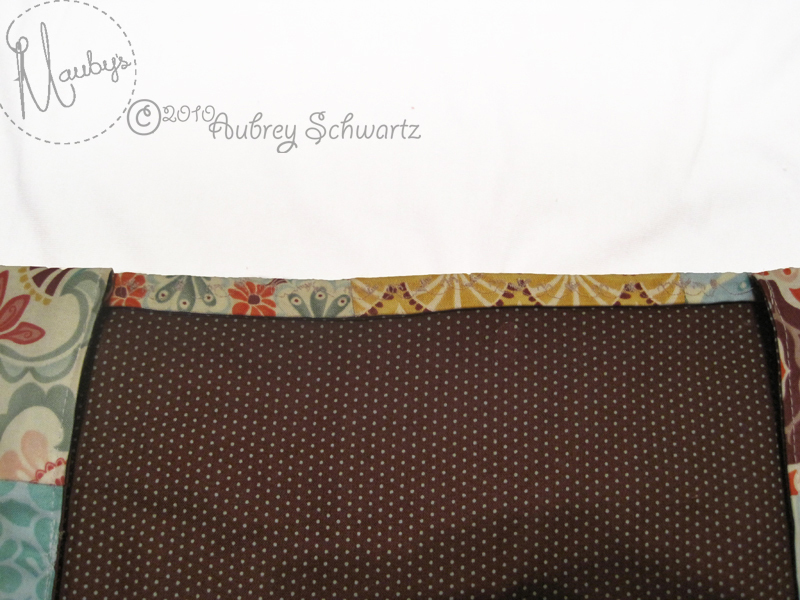 Sew the opposite lengthwise edge from top to middle, then stop and leave a 2-3″ turning gap unsewn, then sew from the end of the gap to the bottom of the edge. 9. Turn book cover right side out through turning gap. Push out all corners and press. 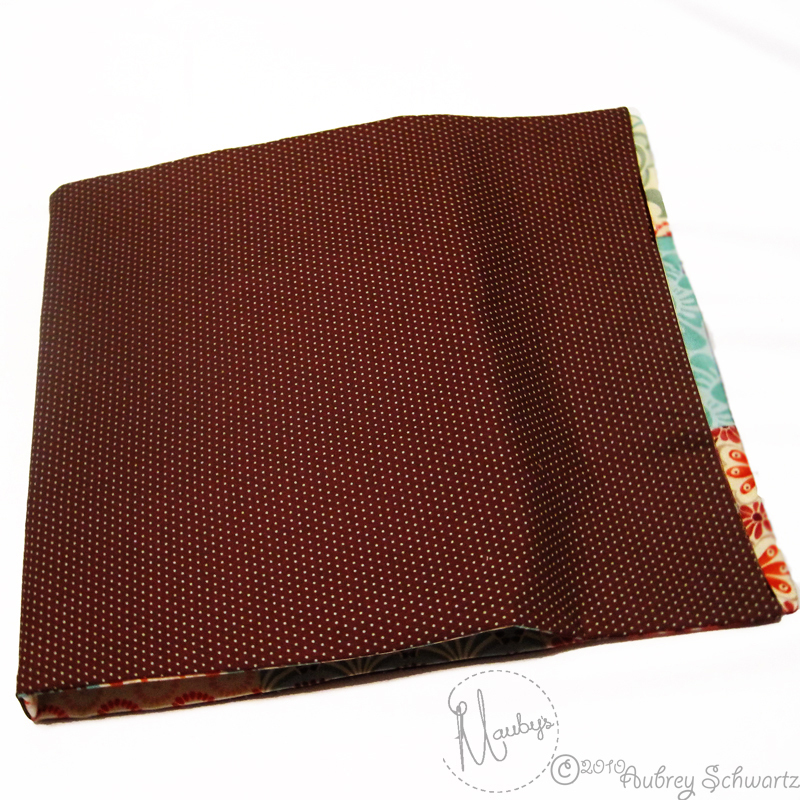 Sew the lengthwise edges with a 1/8″ edge stitch. 10. 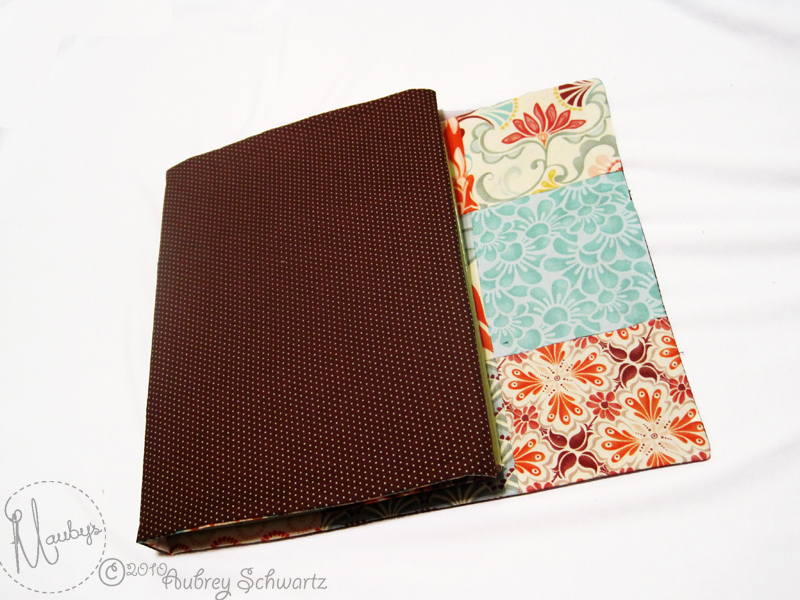 Place book on top of the top of the cover, center book on the very center of the cover both widthwise and lengthwise. 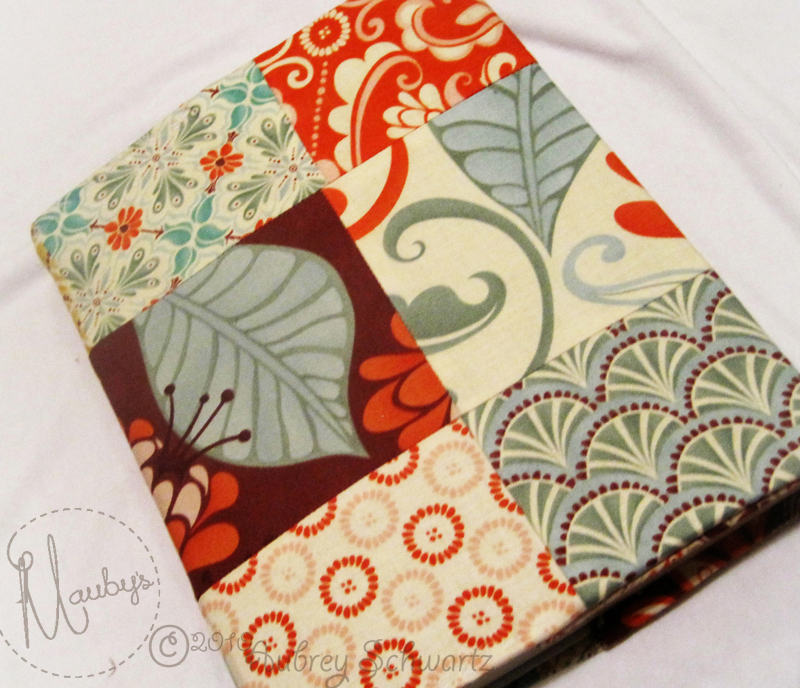 Fold cover over the book so that that all edges meet. 11. 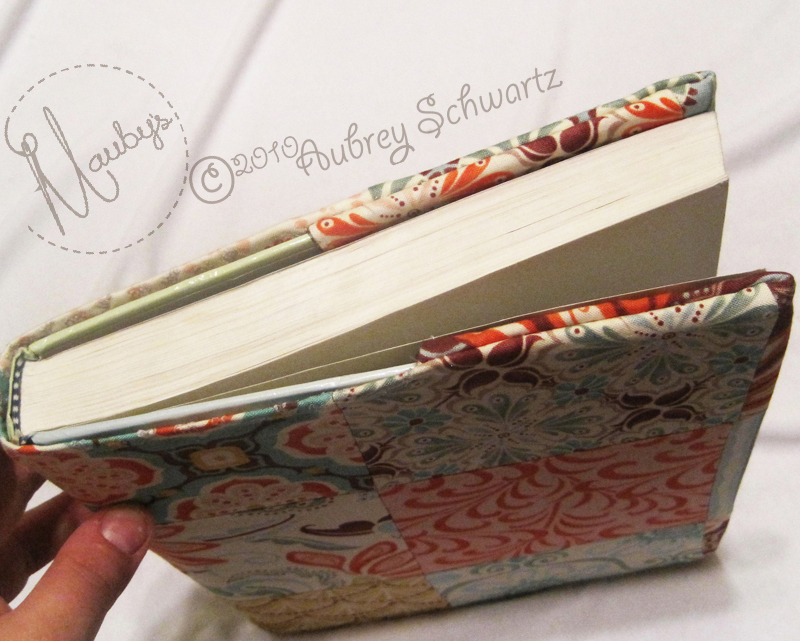 Fold the top edge under the book cover and pin at the lengthwise edge creating a book “sleeve”. Carefully remove the cover from the book keeping the “sleeve” and pins in place. 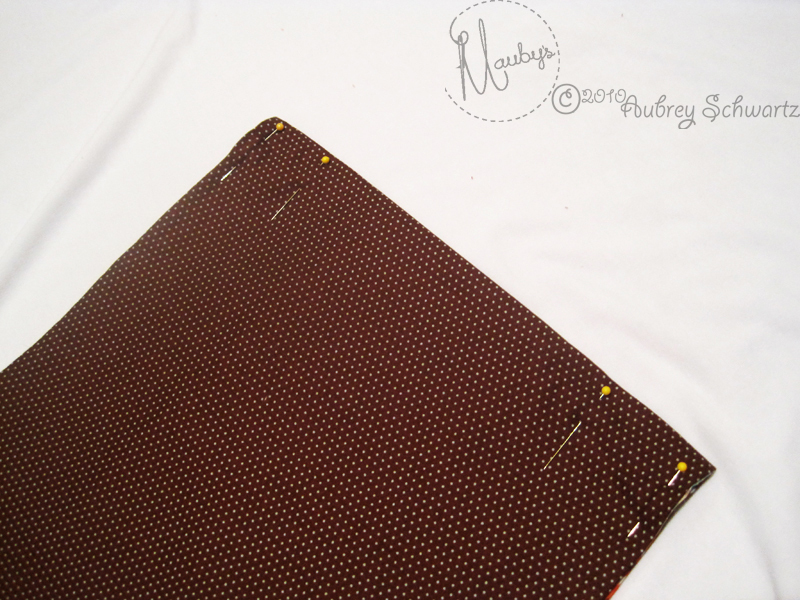 Add pins along the lengthwise edge. 12. Sew along the edge creating a sleeve. 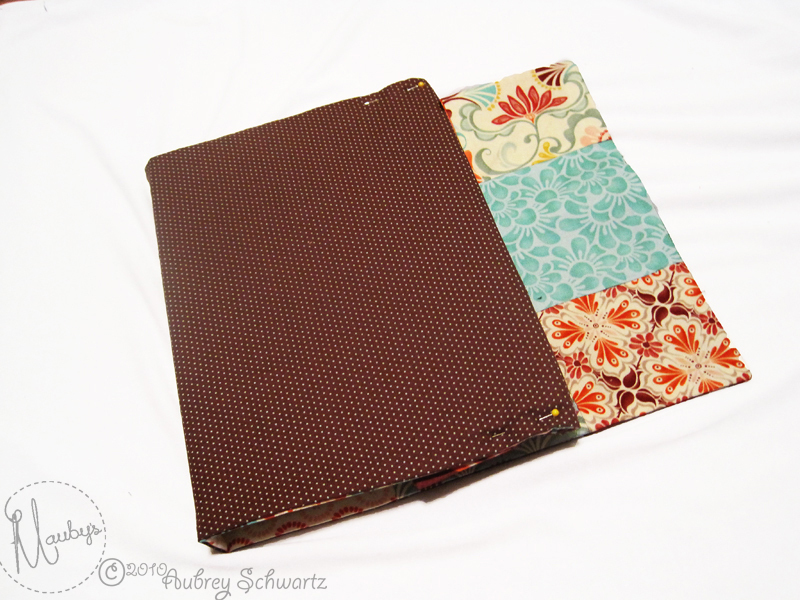 This is a little tricky, you want to sew a straight line along the widthwise edge in the exact place where you pinned the “sleeve” while it was on the book. 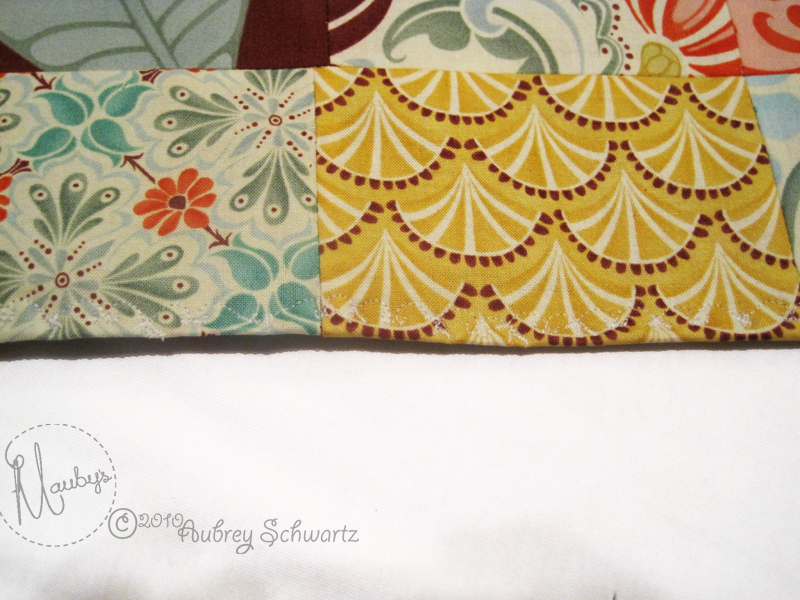 You can wing it or draw a line after pinning the rest of the sleeve edge down. I’ll be honest…I winged it and it turned out fine. I lined up the pin with the stitch line on my sewing foot and looked at the seam guide to determine the seam allowance, then I just sewed the edges with that seam allowance. 13. 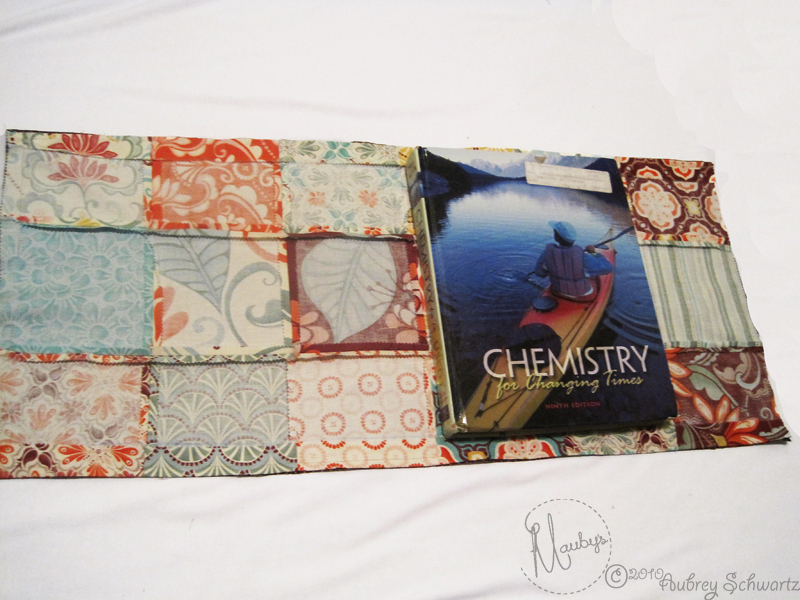 Put sleeve just created on the top of the book and wrap cover around book again. 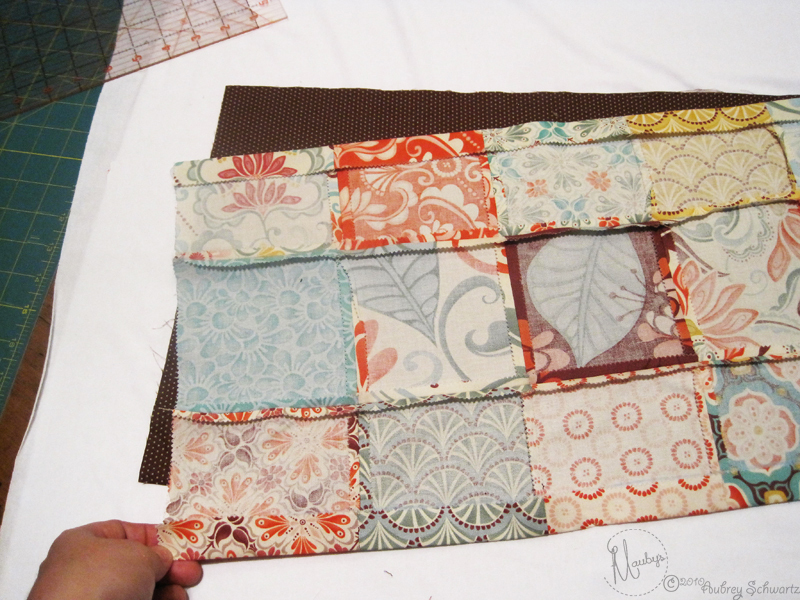 Create “sleeve” on the opposite side following the previous “sleeve” steps. 14. Turn “sleeves” right side out. Push out corners and sides and press. 15. 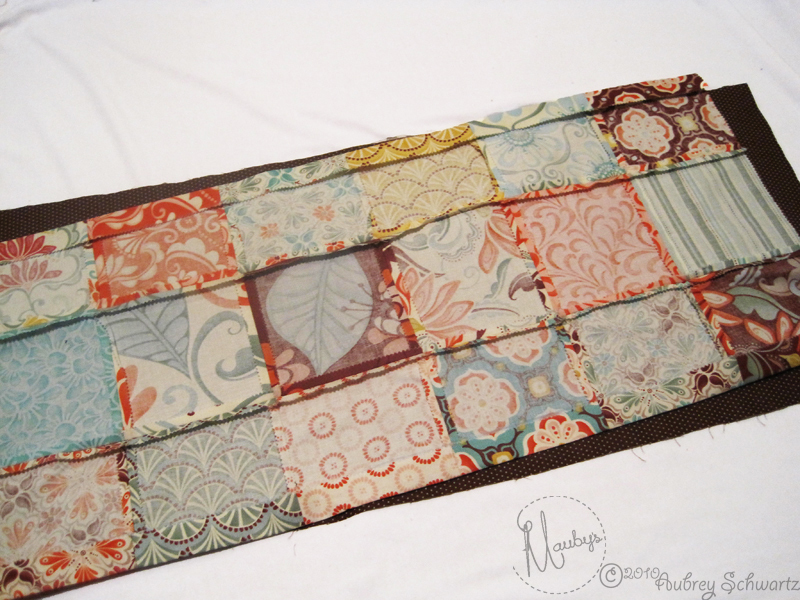 Sew the edges in between the sleeves with a decorative stitch, securing the edges together. 16. 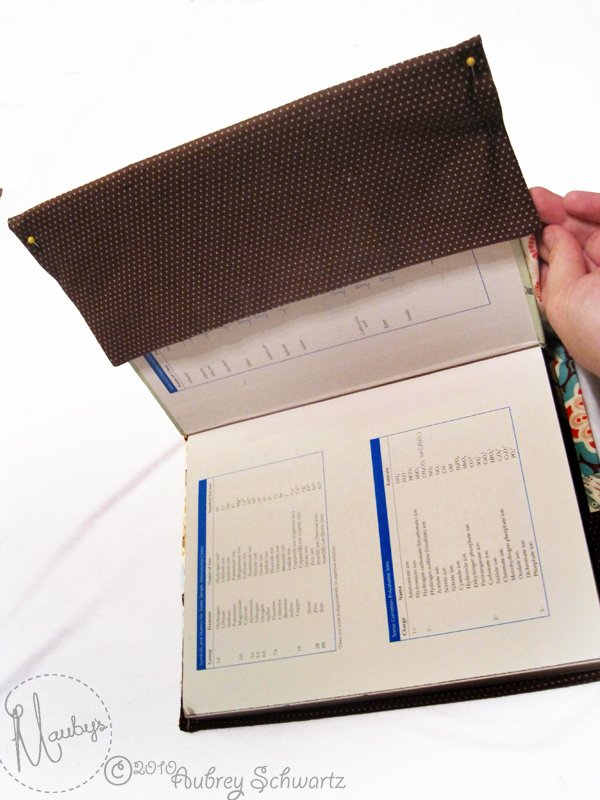 Now put the cover on the book just like you would with a paper bag cover, one sleeve at a time. Close the book and tada! A beautiful cover that can be removed and washed! Now I am off to cover ALL my books! How about you? 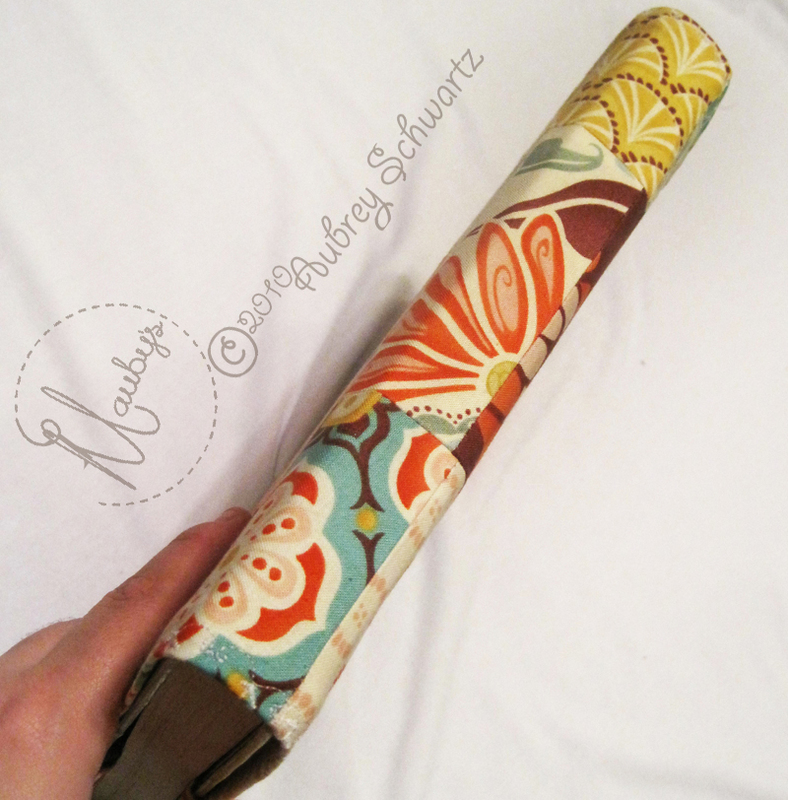 1 or 2 book covers depending on the size of your book. 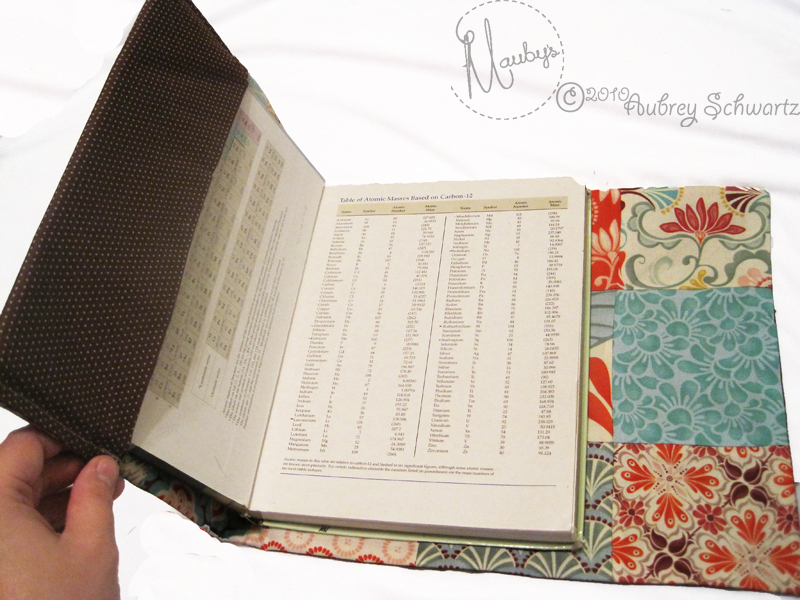 Great for school books, cookbooks, or books you want to fancy up a bit! Make some for each Holiday too! 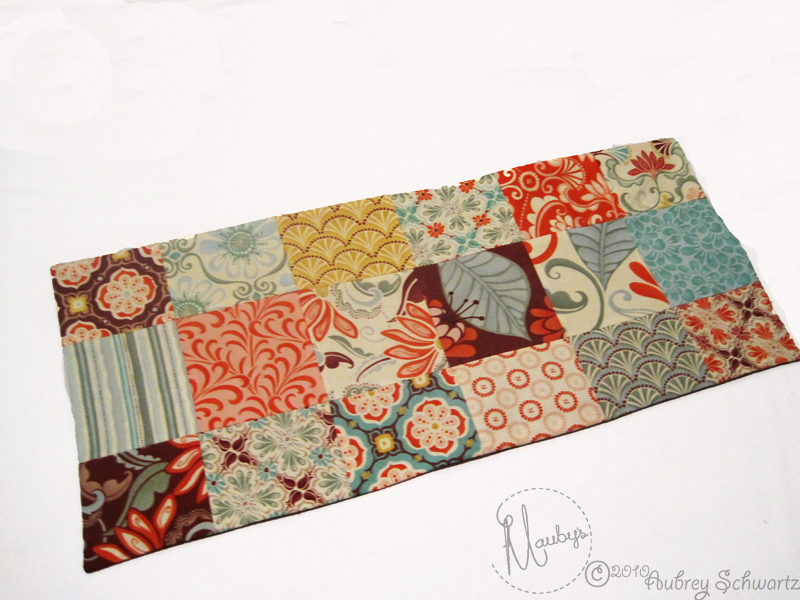 This entry was posted in Accessories, Charm Pack, Easy and tagged Fandango, Kate Spain.